I take a lot of pride in knowing as much as I can in Adobe Camera Raw and Photoshop. I spend countless hours experimenting with features from the most basic to the incredibly advanced. The other day I was in Adobe Camera Raw and I saw this brush I had never used. It is called the Targeted Adjustment Tool. I immediately took to the internet and looked up when that slipped into Adobe Camer Raw. The Targeted Adjustment Tool took me a bit by surprise at first. I selected it, clicked on my image and moved my mouse. My image was getting darker and lighter but I had no idea why. As it turns out, the Targeted Adjustment Tool (hotkey is T), is a shortcut to things like the parametric curve, hue, saturation, and lightness. The tool itself does not change the parameters. Instead, it acts as a shortcut to the Curve and HSL panels in ACR (in Lightroom this tool is found in the respective modules). If you select the tool and right click anywhere in the editing pane, you can edit the tones and colors “on the fly”. For instance, if you are in the basic exposure module you may not see any sliders moving as you wave your hand back and forth. That is because the targeted adjustment tool acts as a dynamic shortcut to the other editing modules. It really expedites the editing process in Camera Raw. One word…………AWESOME!!!! Thanks so much. No problem! Glad we both know now! Nice one which I too had missed. It got the best of both of us! I’m not sure what browser you are working with, but it seems fine here. Can you describe what exactly is not working. That would really help. 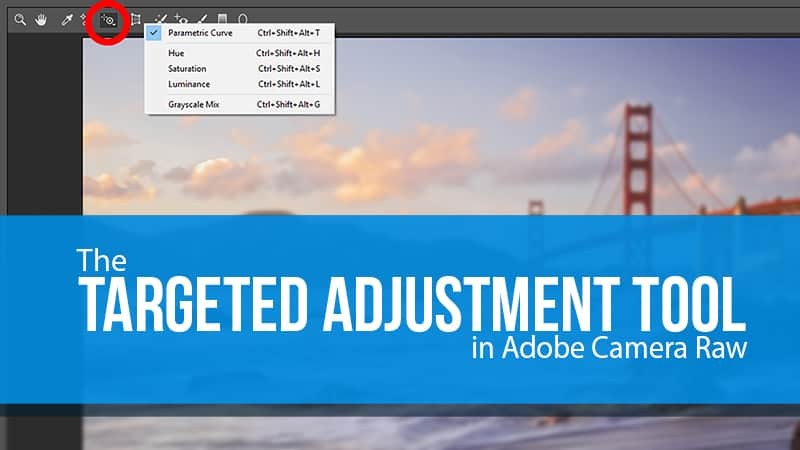 thanks for the targeted adjustment tool tip. Nancy and I are just at the beginning out map out a major driving trip across the US. We spent 10 days in NM at the northern end – Ghost ranch area, and where enthralled. Took a look – thanks to Google Maps at Moab Utah. Thanks for that tip too. Downtown Colorado River basin Whooo-ah! That was terrific. I follow you and other folks, and frankly your levels of knowledge and talent sometimes make me feel moronic. It was nice to see you can be human too. I bet the last time you bowled you may have even missed a spare. Eeek you don’t want to see me bowl! Thanks for stopping by! Is there a similar tool in Lightroom? It is in Lightroom, but it is in the respective module. In the Curve module you will see it in the upper left corner, similar to that of the HSL module. Thanks, Chas. You are correct. There is so much in Photoshop that we rarely need to go out of it. However, with a program like PS, that has been innovated on for over 20+ years, things start to get lost. Plugins make things easier, but that doesn’t necessarily mean we need them so long as you know where to find them in Ps. I think Plugins are great for beginners and people just getting to know editing. But once you get to the intermediate to advanced level all you really need is Photoshop. Then begs the question…. Because it is great for people at certain points in there editing career and it handles advanced concepts at the fundamental level. For most people, ON1 Photo RAW is plenty, in some cases more than enough, but then that 10% who just love advanced editing, Photoshop is there. I have been using the TAT in Lightroom for a few years, and after I started using it regularly in my workflow, my camera club scores started increasing, especially in monochrome. I was experimenting on my Windows 7 laptop just now in both Lightroom and Photoshop (both CC with the most recent updates). I found that moving the pointer up to increase and down to decrease also works, as well as the left and right motions you present in your video. Furthermore, when I use the Tone Curve in Lightroom, I can choose the curve to affect all of the color channels, or the R, G, and B channels separately. I did not find that capability in Camera Raw. Does it also have that same capability, or am I missing something? It does have that capability, but only in the point curve, not the parametric curve, which unfortunately cannot be selected with the TAT. Thanks for this video it was very informative. I have seen someone use it on CreativeLive, but, didn’t remember where it was. Thanks! You can do same thing in Lightroom using the HSL sliders…same concept. Blake, Thanks. I knew the tool was there and that I could use it to adjust color ranges that I selected. But, I did not know about right clicking and getting the other options. Just had to watch this with no sound – in London and forgot to bring my headphones, duhhh. Anyway, great video and I like the look of the Target Adjustment Tool. Will give it a try when I get home. Blake, you do look funny when the sound is turned down. I love all your gestures – like me, you speak with your hands. Thanks for another great tutorial! I have played with this before and after my other adjustments in ACR, and I’m not certain it makes a difference where it is in the workflow. Do you have any thoughts about where you prefer it in your workflow? I have always wonder what this tool did. Thank you so much for explaining it. Great job. This is absolutely crazy awesome. Thank you!!!! Hi Blake, What’s the advantage of doing these adjustments in raw vs in Ps? Do we have more flexibility to undo or revise them in Ps or raw? I thought adjustments in raw ‘bake in’ so they’re tougher to alter. Thx! Thanks for your tutorials. Just found you and plan to keep checking out your info. Wish I had been aware of this tool earlier; I would not have had to purchase Vivesa which part of the NIK plug-in suite. Nik is good stuff, but since Google bought out the original developers development of the suite has stopped. Google lost interest and then gave it away for free. I think you training videos are great. Another great video and a tool I have ignored for too long. Thank you very much. It is so convenient and once again very well explained.